I am constantly on the lookout for cheap meals (See: 20 Dinners that Cost $5 or Less here and here). There are some great ideas in those posts, but now I’m looking for those “Oh crap, we don’t have a lot of money next week” meal ideas. We’ve eaten for $30 a week and $37 a week on a few occasions and it’s been tough, but using the cheapest meals possible really helps keep costs down. Some of the meals below may not be nutritionally balanced. That is, they have bare-bones ingredients and may not include any fruits or vegetables. When you have no extra money, you do what you can with what you have; and when you can add extra veggies to your meal, do it so you can add some extra nutrition. But I believe these meals are perfectly fine to serve to your family, whether or not you are in a rough financial spot! Here are 16 meals, breakfasts and dinners alike, that you can make with very little money. 1.) Peanut butter and jelly sandwiches– This one’s a bit obvious, but PB&J is a classic staple. It’s kid-friendly, requires cheap ingredients, and is just plain good. I like to eat mine with a banana and string cheese or yogurt. 2.) 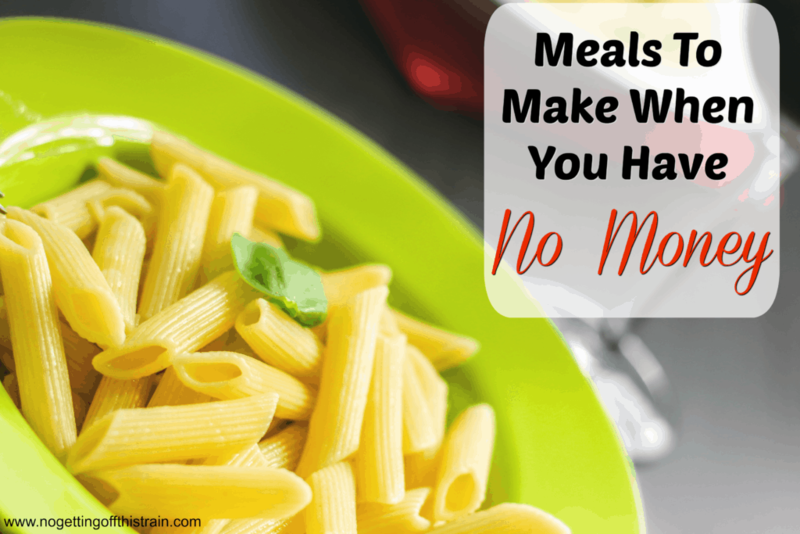 Pasta and jarred sauce– These are items I recommend you keep in your pantry at all times. You never know when you need an emergency meal, and pasta and sauce is as easy as it comes. If you have shredded mozzarella, you can even mix cooked pasta and sauce in a casserole dish, sprinkle the cheese on top, and bake at 375 for about 20 minutes for a simple pasta bake! 3. )Bean and cheese burritos– Here’s my favorite recipe. Homemade refried beans and a little shredded cheese make an easy burrito. These freeze well, too! 4.) Pancakes/waffles– You don’t even need boxed pancake mix to make pancakes/waffles. It costs pennies to make up a simple batch, and it’s a very cheap dinner alternative. 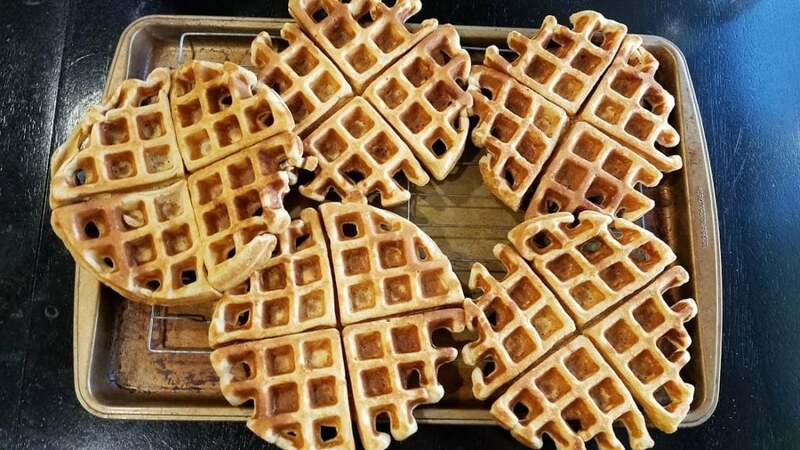 I’m fond of this oatmeal pancake recipe, and this Freezer Whole Wheat Waffles recipe. 5.) Grilled cheese– The classic grilled cheese. You can do pretty much anything with this, but my favorite is sliced cheddar with fresh baked bread. I could probably eat about 5 in one sitting. 6.) Chili cheese dogs– Very simple and filling dinner. Canned chili is the easiest, although if you made chili earlier in the week, you can use leftovers to save money! 7.) Sloppy Joes– Ground beef/turkey with a few condiments cooked together, and it’s a simple dinner! 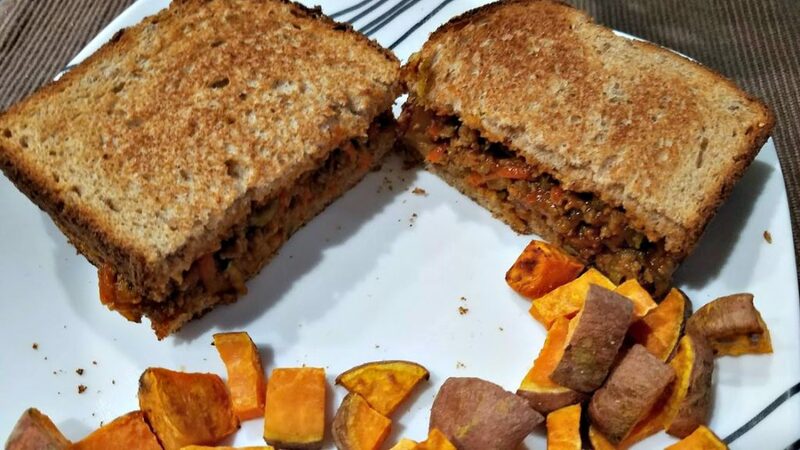 Here’s my favorite Sloppy Joe recipe, and if you’re going meatless, here’s a Lentil Sloppy Joe recipe. This one makes a ton! 8.) Goulash– Who knew something so simple could be so good? Cooked macaroni, ground beef, and tomatoes! Here’s the recipe we use. 9.) Baked potatoes– I LOVE making baked potatoes for dinner. You can add broccoli and cheese, bacon, taco toppings, or even baked beans. I’d never heard of that last one until recently, but it sounds interesting! 10.) Quesadillas– Add anything to it: Rice, black beans, shredded chicken, ground beef, or even just plain cheese. 11.) Red beans and rice– A good way to make plain rice and beans taste better. Here’s my favorite recipe! 12.) Biscuits– Biscuits make a great breakfast item. Make an egg sandwich, add a simple gravy on top, or eat plain with butter and honey. 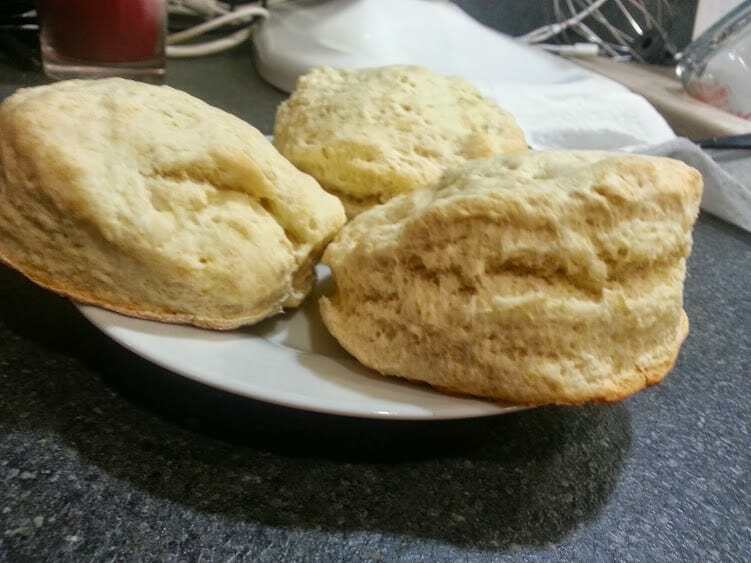 Here’s my favorite biscuit recipe. 13.) Tuna melts– The most basic recipe calls for tuna and mayo, with a slice of cheese, but you can add hard-boiled eggs, relish, or anything to make it more filling. 14.) Egg and cheese burritos– Breakfast burritos are great in the mornings, and even freeze well. You can add ground sausage to stretch it more. 15.) Rice and beans burrito bowl– Maybe I’m weird, but I’m okay with eating just rice and black beans. The best combination, for me, is adding roasted sweet potatoes, and eating it with salsa and shredded cheese. 16.) Oat bars– Any kind of baked oatmeal is cheap and great for breakfast. You can add bananas, chocolate chips, blueberries… The possibilities are endless, and they’re all delicious. Here is a cheap one that contains just peanut butter. 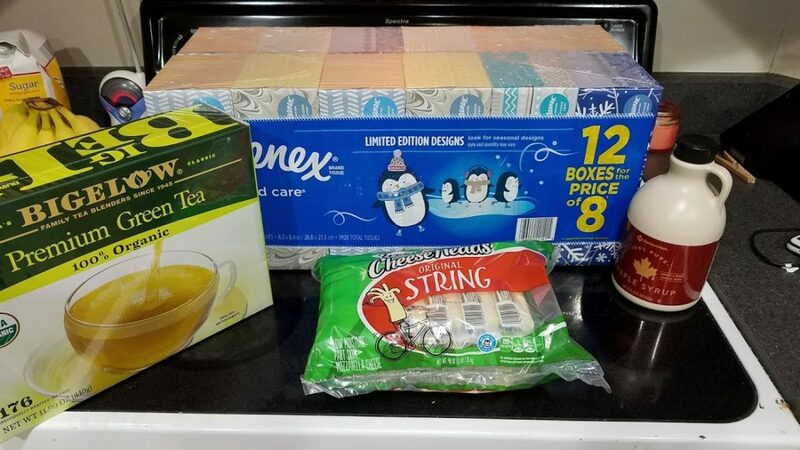 On weeks when we were a little low on cash for food, I would use Swagbucks to help earn gift cards for stores like Sam’s Club to stock up on essentials like toilet paper. That can get expensive, especially when your grocery budget includes household items! Swagbucks really helped when we needed to pay for Allison’s baby formula. Click here to create an account and start earning FREE gift cards to stores like Sam’s Club, Wal Mart, Amazon, and Target! Do you have any tested recipes to add to this list? Please post in the comments below! How to Use Your Pantry to Make FREE Meals! 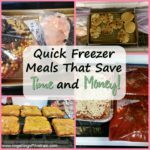 Quick Freezer Meals to Save Time AND Money! Yum, these are making me hungry! I’m pinning this for later, when I meal prep I get tired of eating the same thing 3 or 4 days in a row. Thanks for sharing! When the kids were small, Indian fry bread was a big hit on those days! Try Mexican style sopa for a tasty change, lightly brown any type of pasta in hot oil, then add a can of tomato sauce with enough water to completely cover pasta over with about 2 cups extra liquid, salt to taste cook until pasta is tender. It will be a soup consistancy, you can perk it up by adding veggies, chicken, potatoes, bullion cubes, ect. That sounds really good! Thanks for sharing! Hi Kyndell, I’m glad you found me! I have other posts that are similar to this, like 20 Dinners That Cost 5 Dollars or Less. I hope you can find a few things here that will help you during this rough time! Fry Bread can be maid with canned biscuit dough flattened out and fried in oil till golden brown. They can be maid much cheaper making the dough at home. There are many recipes online for how to make it. That sounds good, thanks for the idea! Oh yeah, baked beans, baked potato and a knob of butter is gorgeous! Some people add grated cheddar cheese to it as well. Noms! My kids still remember crockpot pinto beans with tomato sauce and smoke flavoring served with saltines and also spaghetti noodles with buttered broccoli and parmesan cheese as favorite dinners. They never knew I made up those meals when we had nothing else to eat. That’s amazing! Kids are so resilient. =) You did a great job providing even when you didn’t have much. I am a grandmother raising 5 grandchildren. Thank you for your recipes for dinner and . breakfast, I have one that my kids like, it’s english muffin pizzas. One package english muffins split. Spread with pizza sauce or spaghetti sauce. top with cheese and pepperoni or with anything else you might like on a pizza. Place in toaster oven or oven until cheese is melted. Bagels are good too! I teach Culinary Arts at a high school, we had dozens of bagels left over from an event so the students made bagel pizzas! You would have thought I taught them to make the best meal ever!!! You can do pizza on a tortilla too! That’s amazing! We’ve made something just about like yours: a box of mac and cheese, some taco meat, a can of diced tomatoes, and shredded cheese on top. I think it’s called Cheesy Beef Skillet! One one of our favorite breakfast or lunch (sometimes a lazy dinner) is a hard boiled egg sandwich on favorite bread. As kids my mom made up elbow noodles, onion, canned diced tomatoes and bacon. Fry the bacon then saute onion in grease. Add tomatoes and the bacon to onion and heat all together. Pour over boiled elbows. I still love it to this day and so do my kids. That sounds delicious, Kelly! And cheap, too! I make Cincinnati Recipe Chili once a month – a pot costs maybe $5. I use ground beef that I often have in the freezer, one can of tomato paste, and a packet of Cincinnati Recipe Chili Mix (https://www.kroger.com/search?query=cincinnati%20recipe%20chili%20mix). Put over spaghetti noodles with cheese on top or make into coneys. So good! homemade biscuits with homemade white gravy and if you have bacon use the bacon and bacon grease to make the gravy. My family loves ground beef with carrots and/or peas. Sometimes we eat this over rice. Sometimes just plain. Add a little seasoning and this is really good. Nice! That’s a good frugal meal. =) I seem to remember making a casserole a couple years ago that had just ground beef, rice, and a can of tomato soup. I could probably add some extra veggies to it too! Add some shredded cabbage and diced onion and you have a lazy cabbage roll casserole. Try Ground meat, browned with onions & peppers, garlic salt. add a can of veg. soup serve over mashed potatoes. Chipped beef gravy w/hard boiled eggs on whatever you choose. Bowl of wide egg noodles w/ bacon, garlic, green onion, and soy sauce. English muffin pizza’s can’t go wrong. We love English muffin pizzas here! We’ve also done bagel pizzas. Just a few minutes in the oven and you’ve got a simple but delicious dinner! We make English muffin pizzas too. And when we have leftover burger or hot dog buns we do pizza on those too. Tuna pot pie was a favorite of ours that our mom made.. Mix and put in an already baked pie shell and add cheese on top..
Cover with aluminum foil (spray with non stick spray..
Bake for 35-40 mins in 350 degree oven..
That sounds super easy! =) Thanks for sharing! 1 lb regular or hot pork sausage, 2 cans black eyed peas, spices to taste, such as garlic, onion, sage, and thyme. Brown sausage, add peas with liquid and spices. Bring to boil then let simmer uncovered about 10 mins until thickened and flavors combine. Serve with a little shredded cheese or cornbread on the side if desired. Traditional Hoppin’ John also has tomatoes, rice, and okra. My family doesn’t like those things, so I leave them out. It makes for a fast, economical, high fiber, high protein dinner. Especially right now, when you can stock up on sausage on sale for Christmas, and black eyed peas on sale for New Year’s. HI. First of all. .. sorry for my English, î am from Belgium. When we have no money for groceries î look in my freezer. Most of the time there are some vegetables and î make soup. Put some pasta in there as wel. My kids love this. I love a micro baked potato topped with cottage cheese then cook a little longer. Splash a bit of Italian dressing on top. Quick filling lunch when in a hurry. One of my favorite dinner meals is hamburger soup. Ground beef, lots of sliced carrots, some onion and garlic, maybe some celery, tomato sauce, beef broth, Worschester sauce and a bay leaf. Filling and satisfying on a cold day. I have also found Knorr sides, pasta or rice for $1 at Walmart, that can be jazzed up with a little meat or vegetables make 2 meals for my lunch. I have started making my own chicken pot pies with frozen crusts, a lg chicken breast cut in small pieces, carrots, celery, onion and a can of corn. Even less expensive if you make your own crust. I am a big fan of meals that have left overs for lunch the next day! We love leftovers for lunch, too! These are all delicious ideas; thanks for sharing! Cooked elbows with a can of diced tomatoes, add a little salt/pepper…take some slices of bread, smear butter, add garlic salt, broil…yummy quick cheap pasta and garlic bread meal. To stretch taco meat and some small diced fried potatoes thrown into a fry pan with a little oil. Cook in a little water with some hot sauce when the water evaporates the potatoes will brown-a good way to extend ground beef or turkey for tacos. Saute some cabbage (or your prefered veggie) and add to whole wheat linguine or angel hair with a homemade stir fry sauce. Black beans with sauteed onion and red peppers with a small amount of bbq sauce make a good topping for baked (or microwaved) sweet potatoes. Also, sauteed diced sweet potatoes with the black bean mixture above makes a delicious quesadilla. Homemade refried beans using a can of red beans added to sauteed onions with chili powder and cumin, add some water and smash the beans. They are good on totasdos with shredded lettuce, onion and diced tomatoes. Also teriyaki chickpeas or spiced lentils with carmelized onions on top of brown rice . I could go on and on but these are a few of my go to easy recipes. I don’t believe that you have to spend a ton of money or spend alot of time in the kitchen to enjoy good food. As a kid, my mother used to make macaroni and eggs: cook and drain elbow macaroni and add to a skillet with a little butter over medium heat. Add eggs, salt and pepper to taste and stir to scramble the eggs and mix with the macaroni. These days I like making it with boxed macaroni and cheese. It works great with leftover macaroni also. I love to eat it with ketchup and it is great with a little chorizo. That’s really interesting and sounds delicious! =) I’ll definitely need to try that with the mac and cheese in my pantry. We plan meals off the store ad from Sprouts most of the time. The stores in our area of OKC will give out rain checks on most items that are on sale they run out of. I also share online ordering with family or friends. We get to free shipping a lot faster. Our biggest savings was moving our phone plans to Walmart straight talk. Excellent service but you have to change your APN settings if you have a phone from another carrier. I have a ATT phone on the Walmart network. Mmmmm….yes. Diced spam and potatoes fried together until it is all brown and crispy! Potato soup was a big one in our house. When my Mom had bacon she would add it. If not no. Pancakes were a getting close to Friday payday with no food meal. Potato soup is delicious, and a great way for me to use up any extra vegetables! And pancakes/waffles are done here at least once a week. =) We love breakfast for dinner. Those are all awesome ideas, Jenny! Thank you! College soup,, I never had money ,, and two kids,, I fry lightly one cup of any kind of pasta,then boil it in salted wated, pour off all but two cups of the pasta water, add one boullion cube, chicken, and add pepper if you like, one teaspoon of butter, and one can of chicken broth. Bring back to a summer,, I used to add a shredded carrots and a stalk of celery cut thin, as well. It’s still one if my favorite soups and my girls that are now adults still love it. Little did they know I made it out of desperation. I used to pack around saltines from the student Union building cafeteria and serve on the side. I like to stretch ground meat for tacos with finely diced potatoes and a can of corn. I also like to make my own version of dirty rice with anything I have around. Ground meat, canned tomatoes, corn, onions etc. And finally cabbage and potatoes in the pressure cooker with onions and some sausages. Very simple but yummy and filling. Those are all great ideas! I’ve never thought to add small diced potatoes to taco meat. Corn Chowder- fry some bacon, drain and reserve, fry a chopped onion in the fat. Add diced potatoes and enough water to cover and cook til done. Stir in 2 cans creamed corn and 2 cans evaporated milk. Season with salt and pepper and add crushed bacon. You can add as many potatoes as needed and can also add another can of whole corn to bulk it up. Makes about 8-10 servings. I usually have the ingredients in my pantry for emergencies. Could be made without bacon and just use butter. Very handy recipe! Every week i make a big casserole of différent soup with what i have in the fridge; broth, vegetables, rice or noodle, spices, you can eat this with bread or crackers, its cheap and good! The majority of these suggestions are not very healthy. Most are high carb, high fat and high sodium options. Folks who have little money to spend on food, need more healthy options that can be stretched out to multiple meals. Soups, Casseroles and salads. Eating poorly tends to cause more health issues and weight gain. The more one weighs, the more food they will consume and ultimately spend more money. Thank you, Todd! As I said at the beginning of the post, some of these meals may not be nutritionally balanced; but adding a fruit or vegetable side helps! 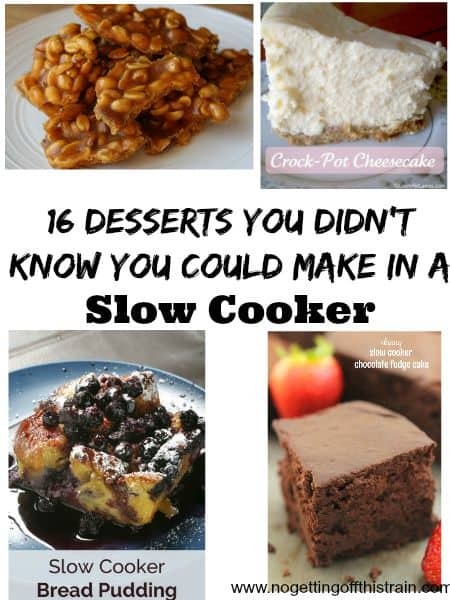 Wow, I have eaten many of these recipes as a child in the 1950’s and 1960’s. Not surprising as my mom was raised in the Depression and cooked what she knew. You have left out the jello salads with canned fruit, however! Also creamed tuna on toast. Make a white sauce with butter or margarine or even oil, flour, and milk or broth. When bubbling, add can of tuna, drained and mix. Add frozen peas if you have them to stretch this. Serve over toast, cut up for kids. Tip: using a whisk will eliminate lumps.